Paris. Just when he thinks he's hit rock bottom, he finds a new love. for intelligent, sensitive Mr. Ricks. From the New York Times bestselling author of Leaving the World and The Moment comes the riveting story of a luckless college professor for whom Paris becomes a city of mortal danger. A runaway bestseller in the UK and France that has been made into a film starring Ethan Hawke and Kristin Scott Thomas, this suspenseful tour de force from the internationally renowned Douglas Kennedy is the quintessential sophisticated commercial novel. Harry Ricks is a man who has lost everything. A romantic mistake at the small American college where he used to teach has cost him his job, his marriage, and the love of his only child. Hounded by scandal, he flees to Paris, where a series of accidental encounters lands him in a grubby room with a job as night watchman for a sinister operation. Just when he begins to think he has hit rock bottom, romance enters his life in the form of Margit—a cultivated, widowed Hungarian émigré who shares Harry’s profound loneliness but who keeps her distance, remaining guarded about her past. As Harry wrestles with Margit’s reticence, he begins to notice that all those who have recently done him wrong are meeting unfortunate ends—and it soon becomes apparent that he has stumbled into a nightmare from which there is no escape. 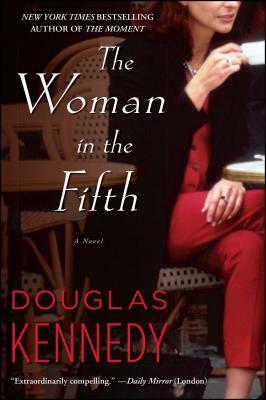 The Woman in the Fifth further establishes Douglas Kennedy as an author who “always has his brilliant finger on the entertaining parts of human sorrow, fury, and narrow escapes” (Lorrie Moore). Douglas Kennedy is the author of eleven previous novels, including the international bestsellers The Moment and Five Days. His work has been translated into twenty-two languages, and in 2007 he received the French decoration of Chevalier de l’Ordre des Arts et des Lettres. He divides his time among London, New York, and Montreal, and has two children. Find out more at DouglasKennedyNovelist.com.